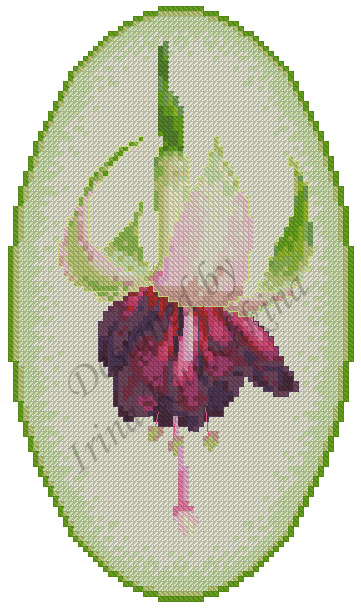 The scheme for embroidery cross "Fuchsia Mood Indigo". The size of the finished work, done on canvas Aida 16: 12 * 20cm, 75 * 125 crosses. We use 26 colors of cotton floss palette DMC. It makes a series of designs with "Fuchsia Ballet Girl", "Fuchsia Voodoo" and "Fuchsia Blush of Dawn"
By purchasing this product, you get the following image files: character color scheme design, black-and-white symbol design scheme, job description (a legend), file illustration of the work. Buying this design, you agree to use it for personal purposes and not otherwise. You agree not to distribute it or publish diagrams in the press. Ready embroidered design of this scheme you can use as you wish, including for sale.